Due to the introduction of small-sized rice planting machines, farm work became even more efficient. Photo Courtesy of Nakasendo Highway: A Journey to the Heart of Japan. In the late 1960s, small gasoline powered transplanting machines about the size of a power lawn mower were invented. They transplanted seedlings that were only three or four inches tall, so the rice could be transplanted earlier and would grow faster. Small gasoline engines also powered devices to help at harvest time with threshing to remove the rice grains from the stalk. These machines were designed to be small enough to be moved easily by one person, and to fit into the small fields. Similar small machines could till the ground in dry fields for vegetables and other crops. This replaced work the farmer previously did manually, or with the help of an ox. At first, villages would buy one or two of these machines for all the farmers to share. Later, as farm households became more affluent, they bought their own machines and did not need to depend on their neighbors any more. 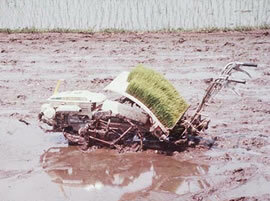 In 1970 there were 29,000 of these transplanting machines in use in all of Japan. By 1980 there were 1,740,000. Click on CHARTS, below, to see how the productivity of farmland has increased since 1950.